My husband and son are straight up obsessed with chicken wings. My son usually orders the boneless variety, but Chad always goes for the bone in version. They both love the garlic parmesan wings from Buffalo Wild Wings, but lately my son has been on a BBQ chicken wing kick. 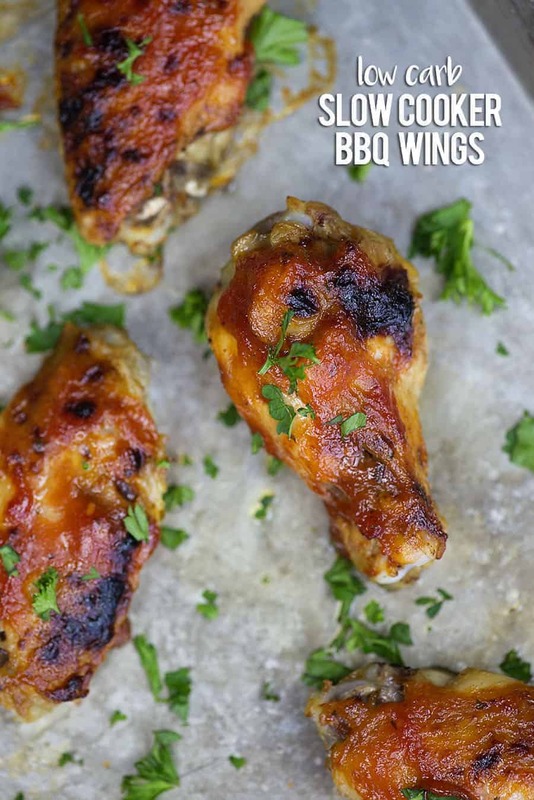 I knew I had to make the boys their favorite wings at home and I’m so happy with these slow cooker chicken wings! I think you’re going to LOVE this easy recipe! Slow Cooker Chicken Wings coated in keto BBQ sauce! Chicken wings are fine and all, but it’s alllllll about the sauce. Right?? Or is that just me? I just love saucy foods! The method is simple! 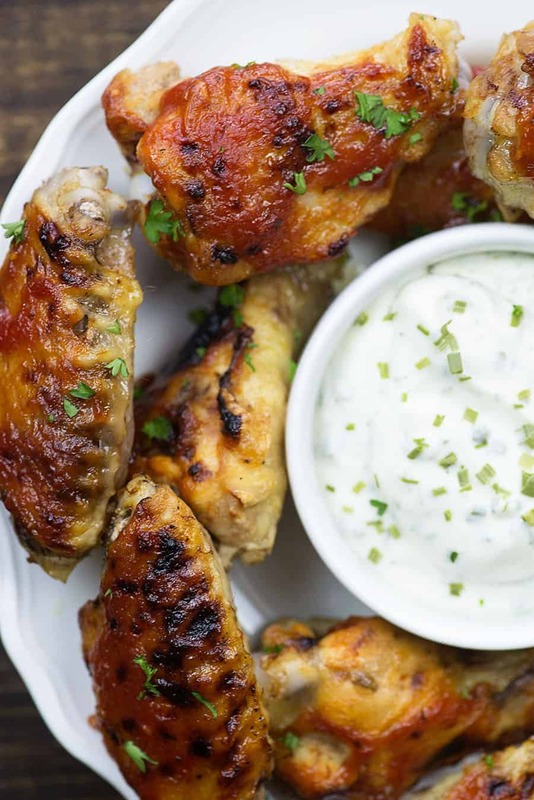 You’ll just grab a bag of frozen wings and toss them in the slow cooker with a little salt and pepper. I know that slow cooker wings sounds a little strange, but I promise these are going to taste phenomenal. The secret comes in at the end…I’ll share in a minute. So, first you pop the wings in your slow cooker. Sprinkle them with salt and pepper, cover the slow cooker, and pop it on high. 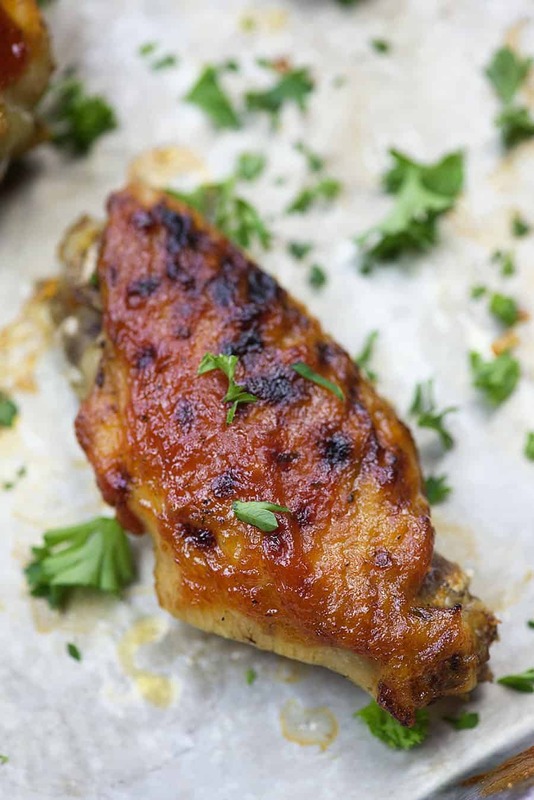 You’re going to cook these keto chicken wings for 1 hour and 30 minutes on high. The wings should be just on the verge of falling off the bone. You don’t want the meat totally falling off the bone or it will be difficult to eat, but you want it nice and tender. Are you ready for my secret to slow cooker wings? Finish them off under the broiler!! Seriously, this makes all the difference in the world. Slow cooker wings come out of the crock pot with rubbery skin, but we can totally crisp it up in no time. I just place the wings in a single layer on a large cookie sheet. You might need to do this in two batches, depending on the size of your cookie sheet. Pop them under the broiler for a couple of minutes to just start crisping up. You won’t believe how easy it is to make low carb BBQ sauce. You just need two ingredients that you probably already have in your house right now! Reduced sugar or sugar free ketchup + bottled Italian salad dressing! I know it sounds totally weird, but just wait. The sweet ketchup paired with the tangy Italian dressing makes…keto barbecue sauce! Like magic! Brush your wings with the sauce and pop them back under the broiler. I like to let the sauce caramelize a bit. It gets sticky and really coats the chicken. So good! 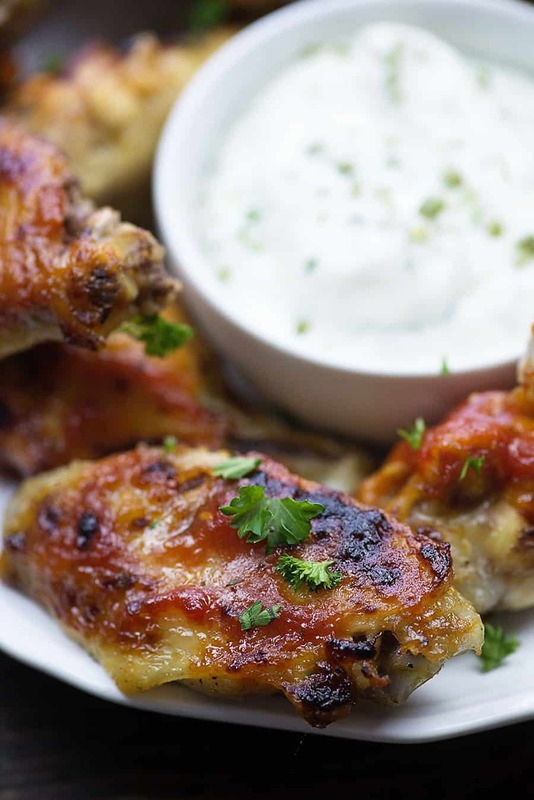 I like to dip my BBQ chicken wings in ranch dressing. What will you dip yours in? My chicken stir fry recipe is another favorite low carb chicken recipe! 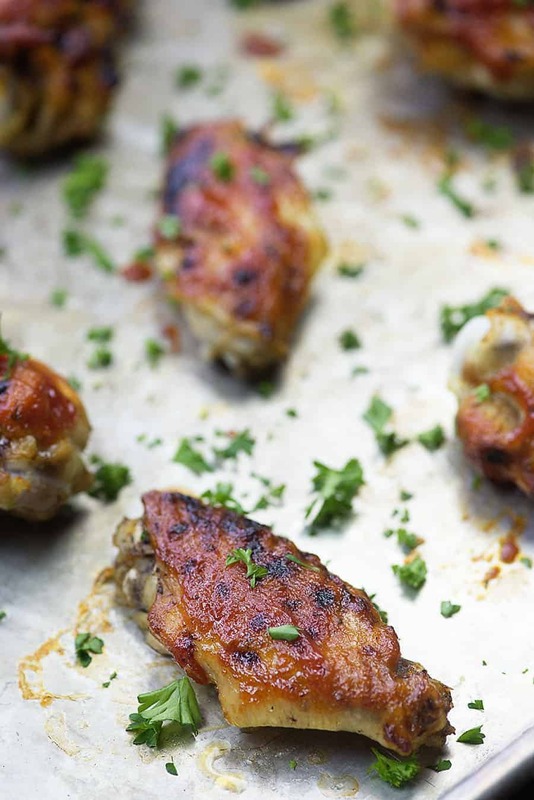 Give these low carb slow cooker chicken wings a try and let me know what you think! 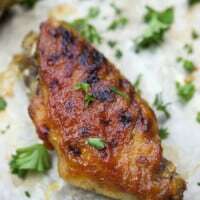 These keto chicken wings are made in the slow cooker. So easy!! And the low carb BBQ sauce is just two ingredients and tastes amazing. We put it on everything! Place the coated chicken under the broiler and watch carefully for the sauce to caramelize, about 2 minutes. 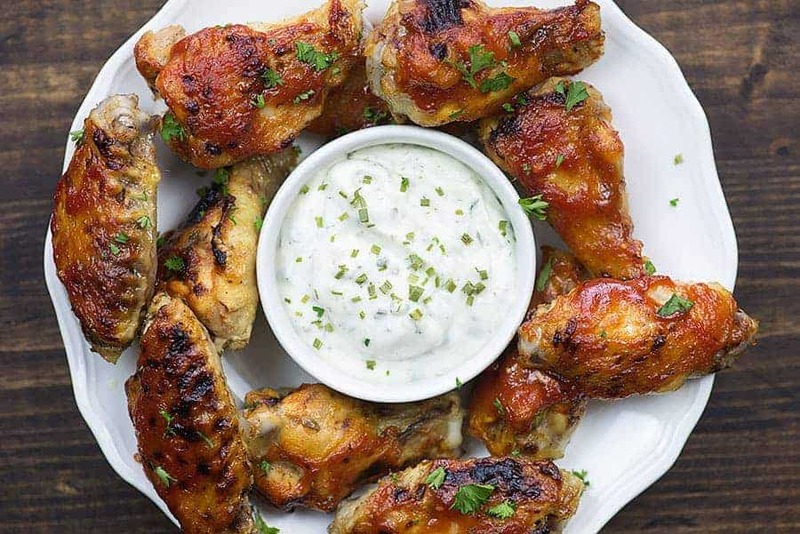 These low carb chicken wings are great dipped in ranch dressing! Do the wings have to be frozen or can they be fresh? Will that change the cooking time? I’ve only made this with the frozen wing sections. It will likely take less time to cook if you start with fresh chicken. I made Slow Cooker BBQ Chicken it was delicious. Next time when I grill my chicken I’ll be using the bbq sauce that was on the recipe. Love the low cab garlic shrimp. Looking forward to more low carb recipes. Thanks for you tasty, fabulous low carb recipes. 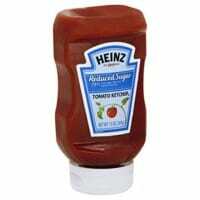 What if I only have regular ketchup?? Then the nutrition values will be different. Your Nutrition info is based on per serving. What do you consider a serving? I made these tonight and they are absolutely delicious! But trying to add to my meal plan unsure what you consider a serving. The nutrition was calculated on this making 8 servings, so divide the number of wings by 8 to get a serving. Hope you enjoyed the wings! I’m trying this for dinner right now,I work graveyard so the crock pot is going to be my best friend as of now especially during these holiday situations).. Timing off?? I was excited to try a wing recipe that I could at least “start” in my crockpot. I weighed out 4 lbs of frozen wings from a large pack I had in the fridge (on my brand new calibrated scale), and placed in my large crockpot on high for 1 hr 30 min….planning for an outing later on. When I pulled them out, some were still cold in places and definitely didn’t look done. I did the “broiler” part, but they’re still not near done, so I’m attempting to bake them until done, then add sauce etc. For this reason, I’m giving this recipe a lower star rating…even if they end up tasting good. 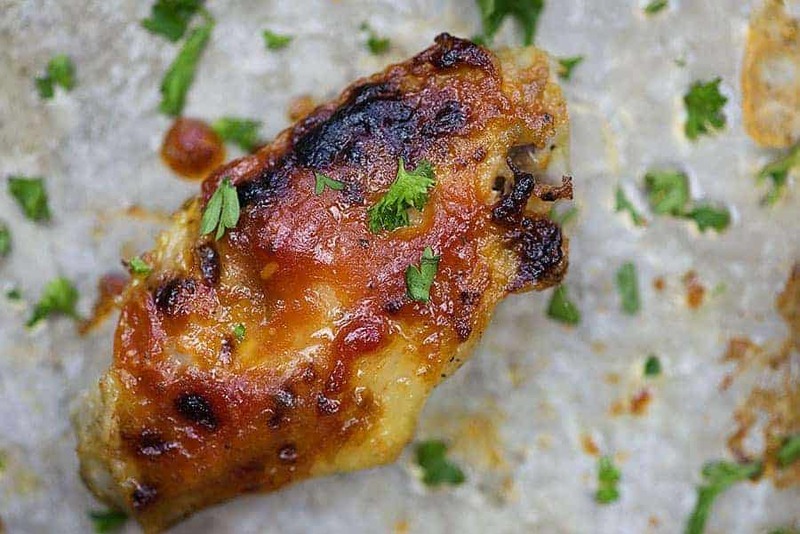 Did you put frozen wings in your Crockpot or thawed wings? The recipe says “thawed” wings…..not frozen. The recipe calls for thawed wings, but on one of Karlie’s above comments, she says she only uses frozen. Which is it? 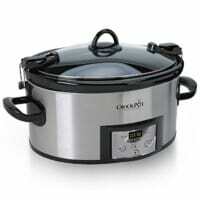 Do you place frozen or thawed chicken wings in the Crock-Pot? Sorry about the confusion! I buy a bag of the frozen wing pieces and thaw them before cooking. Just by looking at the picture makes me so hungry. This looks so good! I can’t wait to try this. Thank you for sharing! I’ll definitely going to try this one. I so love chicken dishes. Thanks for this! Do u use creamy italian dressing ? No, I use the oil and vinegar type that isn’t creamy.